To really talk about how to use a tool we need to be able to point to specific buttons and understand the user’s context and experience. Given that we often have many tools to choose from, that we use them in tandem and that that the tools a community uses interact with each other in complex ways, how we talk about the tools and people’s experience matters. That experience affects usability, learning and collaboration. Although most people probably think of Skype as a personal or individual tool, it is complex enough to demonstrate the issues involved in understanding a community platform. This post demonstrates the language we developed in Digital Habitats to make sense of the technology landscape on just one tool. First of all, Skype is not just one tool. It’s a platform with lots of different tools on top of it. The tools tools in Skype are essential for my work as a community leader. If you follow this discussion about how all of them work together, you’ll have a good example of the approach we developed in Digital Habitats to make sense of platforms in a way that brings out the issues around tool comparison, duplication, and integration. 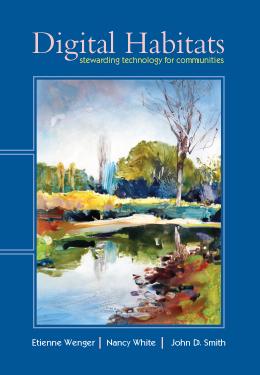 One-to-one interaction on-the-spur of the moment is ideal for reaching out to community members – to find out what’s on their minds or provide exactly the help that they happen to need at that moment. In my community work I make it a point to ask people for their POTS phone numbers or Skype IDs. In this post I discuss several Skype tools (not all of them) in terms of how their features are useful, how they work with each other and how they work with tools on other platforms that people in my community might use. In a way this puts to work some of the analytical framework we develop in Chapter 4 of Digital Habitats. The polarities discussed in Chapter 5 are a big help in organizing our thinking about these issues. So I represent each tool with a screen-shot and a diagram below it suggesting how the polarities seem to me at the moment. 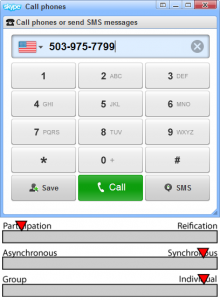 The phone diagram shown below indicates that I think the phone is on the participation end (unless you reify the conversation with a recording); you have to participate in real time, so it’s synchronous (exchanging voice-mails moves the red triangle toward asynchronous); and it’s a one-to-one experience, so I place it close to the individual end of the spectrum. The placements in this diagram then determine the placement of the tool in a tool landscape at the end of the post. Notice that the two tools are really different in cost and function: it costs a small amount to call someone on a regular phone and you can’t receive a call back from them unless you buy a POTS number from Skype. A Skype-to-Skype call is free and it’s very easy for someone to call you back if they miss your call. Integration asymmetries between Skype and other platforms force different interfaces, so make me think that Skype has two different phone tools. You make a call to another Skype user using its contacts list tool. The contacts tool partly overlaps with my Outlook, Gmail, and mobile phone contacts tools, but it things that the others don’t. One is to show who’s currently “available,” indicated by a green dot with a check-mark in it, so it works like a global “presence indicator.” Also, you can group contacts, rename them, send them to other Skype users and perform various other actions. Your personal contacts list is available whenever you log onto Skype – from whatever machine you use. (Surprisingly, the same account can be logged on from two different machines.) 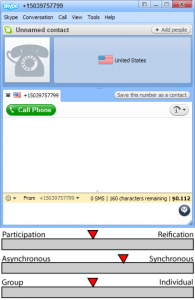 When you click on a Skype contact, you have the choice of calling their regular phone, which will cost you but is more attention-getting, or calling them on Skype which only “rings” on their computer. In my opinion the most polite way to reach someone is to first check if they are available using the text chat tool (discussed next) and then call them on Skype or by regular phone only after the other party has responded that it’s OK to call. If we’ve made an appointment to talk and the other party doesn’t respond, I may call them on their regular phone, which rings loudly (and may be a mobile phone that they carry with them). Like the phones, Skype’s text chat tool is complicated: it’s the same on the front end, but different on the back end. The text chat with other Skype users is a full-bore chat tool: like an instant message tool but better because it’s integrated with other Skype tools. For me it is the most frequently used of all Skype’s tools. Messages can be long and replying is easy. The interface is clean and it’s very robust: people are not dropped off a chat and they receive chat text even if their machine crashes. Skype keeps the chats on your machine since you installed it and you can search through them. You can send a 160-character SMS text message to a mobile phone from the same window you use to call a POTS number (provided the number goes with a mobile phone). That’s handy but asymmetrical because a reply message from a mobile phone can only go back to another mobile, not to you on Skype. So it works more like an alert than a conversation tool. 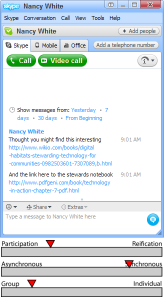 Nancy White and I regularly use the Skype text chat as an alert – to drop notes off on each other’s desks. Often the drop-off is a URL and the message is no more than “Hey, look at this!” A direct message on Twitter or the inbox feature on http://delicious.comwould be obvious alternatives, but on a windows machine Skype blinks so it’s visible and hard to miss. No response is required but an alert can lead to extended conversations. Chat is one of the most versatile tools we have. A chat is useful for alerts, for sharing, for conversations, for negotiating meeting times, and on and on. It’s ironic that there are so many different and incompatible chat protocols and tools. Once you have a chat connection with someone the possibilities for collaboration increase dramatically. How many profiles have you grudgingly completed in your life, imagining that someone you really need to be in touch with will find you? One for each community tool you have ever used, perhaps. If you’re like me, you’ve completed dozens of them and probably most of them are now out of date! Our likelihood of keeping them up-to-date depends on how frequently we use a tool or how close at hand the profile tool is. I keep my Skype profile current because I consider it an interaction tool, not just a publication. Skype’s profiles are in a proprietary format and not available outside of Skype. However you can send a profile to another Skype user. The Skype profile tool is an example of a tool that’s mostly an individual’s public description of themselves. But when you use the “mood message” to let people know where in the world you are or what you’re doing, it’s an interaction kick-off. Skype makes other people’s profiles useful by letting you modify or add to the information that they provide. Skype lets you edit other people’s names, which I find is handy if people haven’t completed their profile. Also, if you have a private phone number for someone that they don’t post on their profile, you can add it to your copy of their profile. Skype would be a useful platform just for its one-to-one phone calls and text messages, but it becomes indispensable because the audio and text tools work in a many-to-many mode. Skype as a conferencing tool makes it a real community platform, especially given how all the other tools are integrated on the platform. Here again the user interface masks differences on the back end. A group chat is extremely robust, working in a point-to-point fashion: any one of those on the chat can drop out (e.g., turn of their computer) without affecting the others. And when Skype comes back up, the intervening text messages that were exchanged among the other parties to the chat magically appear on the machine that dropped out. Audio conferences (not shown in a screen shot) are different: all the audio signals go through the computer of the “host” who initiates the call. If the host drops, the audio call ends for everyone. It’s important for an audio conference to be initiated by the person with the fastest and most stable Internet bandwidth: if the host is on a dial-up connection or an overloaded wi-fi network, it will impact everyone. Another difference between audio conferences and text chats has to do with scale. A large number of people can be on a text chat, but an audio conference starts getting noisy and unstable well before running up against the Skype maximum of 9 callers.If everyone is on Skype, conference calling and group chat are nicely integrated. You have a “call Group button” to launch an audio conference from a text chat and a chat transcript appears automatically when you are on a group chat. When a group is working on a project over a long period, for example, a long-running Skype chat is a great way to keep everybody connected and focused. Ten weeks is the record in my experience. When you turn on your computer in the morning, all the conversations between people in different time zones pop up. 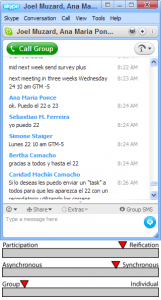 The flexibility of chat makes it an ideal tools for coordinating work on other platforms. Over time you accumulate a lot of contacts in Skype and it’s very helpful that Skype lets you organize them into Groups. Skype automatically creates some groups, such as “recently contacted” or “requests from new contacts.” But you can create as many groups as you want. Adding people to or removing them from a group is easy and you can put people in multiple groups. The groups tool is useful in combination with other tools. For example, when you select a group, you can easily see who is currently logged on to Skype. What that means depends on whether being logged on to Skype at a given point is a norm in that group of people or not. A Skype group makes it easy to start a group chat or a group audio conference. One advantage of using a group to set up a chat is that you include people whether they are logged on or not; when they do log on, the chat messages will pop up on their computer. The polarities and how they play off of each other are intuitive and practical but they are also slippery. It’s more difficult to talk about a tool’s polarities in general than to talk about a specific group’s practice of using a specific tool. People intuitively pick up on the practices around a tool, but these polarities can sometimes help us figure out why things aren’t working. A tool’s polarities are determined as much by their design as by their technological background and how they fit within a larger configuration. For example, where we put an SMS one-way alert message from Skype in our technology landscape is determined by the technology infrastructure; a Skype-to-Skype alert is a convention for some people. Tech stewards need to understand what it’s like to use a tool and to be able to talk about the experience and the tool separately. Preferred, ignored, duplicate, or competing tools all make sense within this social and technical mix we call a digital habitat. Each software feature makes sense within the context of a tool, and each tool is framed by its position on a platform, which has meaning in the context of a configuration that’s shared by a group of people. In a way it’s all circular because you can’t see a community’s configuration (or digital habitat) directly or simply. I’m a Skype user enthusiast. I was influenced in a master’s degree I’ve attended 2 years ago and have disseminate its use among a community of teachers I work with, as an alternative to the traditional phone calls, but often we use the chat function when some trouble occur with the bandwidth at schools.